Programming GUIs with conventional GUI APIs is notoriously tedious. In these notes we present the GEC toolkit in which the programmer can create user interfaces without any knowledge of low-level I/O handling. Instead, he works with Graphical Editor Components (GEC). A GEC is an interactive component that is automatically derived from an arbitrary monomorphic data type, including higher order types. It contains a value of that data type, visualizes it, and allows the user to manipulate it in a type-safe way. The toolkit has a library of data types that represent standard GUI elements such as buttons, text fields, and so on. As a consequence, the programmer works with data types that model the interactive system that he is interested in. Programs are constructed as a collection of communicating GECs. This communication can be arranged in an ad-hoc way, or in a disciplined way, using a combinator library based on arrows. GECs are suitable for rapid prototyping of real world applications, for teaching and for debugging. 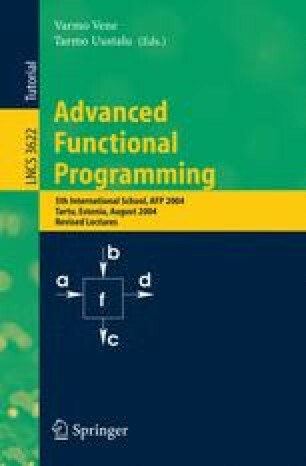 These notes focus on the use of the GEC toolkit for functional programmers, only briefly explaining its inner workings and underlying principles.